Depending on how much of a snob you are, nearly every trip to Walmart can be classified as horror but, personally, I love the place and, other than Big Lots, it's the store where I buy most of my DVDs. 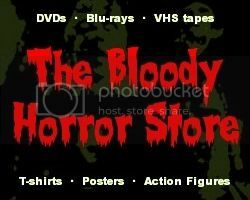 This, therefore, is a recap of the horror DVDs which I've seen there today and what I think of them. In the $5 bins, I saw "From Dusk Till Dawn", "Interview with the Vampire", a four-film vampire collection ("Dracula's Curse", "Bled", "Bram Stoker's Dracula's Guest", "Fangs") and the first three "Puppetmaster" films as an Echo Bridge triple-feature which ruined the theme that was going on there. About a hundred copies of "Beetlejuice" were in the bargain bin too but I didn't even want one of them. Over on the "expensive" DVD shelves, there wasn't anything new that interested me but I was amazed at how many triple and quadruple DVD collections are now available featuring one slightly below average horror film and two or three others that you've never heard of. Most of these are from Echo Bridge and should be avoided unless you want to severely disappoint yourself. Yes, I have already been fooled by them several times myself. I only have one question to the people who put these collections together, just how many copies of "Dreamcatcher" and "Queen of the Damned" do they think anyone actually needs? The same titles are on four different multi-feature packs. Let me answer that for you though. None. There were a few "4 Film Favorites" such as "Blade", "Critters" and the two "Nightmare on Elm Street" collections which are worth the $10 but, the thing which horrified me the most was how many copies of films by The Asylum were sitting there full of their own self-importance as if anyone is ever going to buy them. I have to admit though that the artwork on the DVD sleeves is really good even if it has very little to do with what you'll actually see on screen. If I was very rich and/or stupid, I'd probably buy all of them and think I was really cool for having the world's biggest collection of crap. On the end caps, something even more worrying was going on. Films that are now three years old were still being sold for $13. In particular, it's the Twilight series. Now, as you know, I've seen all these films and, especially as "New Moon" sucked hardest, there is no way that "Twilight" or "New Moon" should still be at full price. Why aren't they $10, $7.50 or even $5? Even "Orphan" and "Jennifer's Body" have finally gone down from $13 to $10 and those are very good films in comparison. Sometimes Walmart's prices simply have no rhyme or reason to them. In the new releases section, the latest arrival was "Stake Land" but I didn't notice anything else there which was horror. Anyway, I suppose I should have taken pictures but knowing my luck, I would have been sued for some kind of copyright infringement and forcibly ejected before I could buy the packet of "Mike and Ike" candy, two chocolate doughnuts, and the Monster energy drink that I was clutching all the way round. 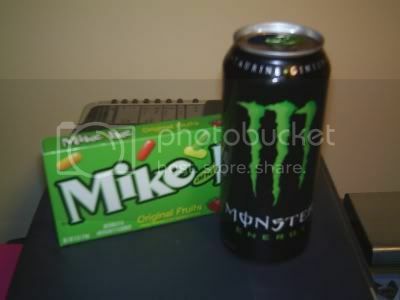 Here's a picture of the "Mike and Ikes" and empty Monster can, I already ate the doughnuts before I got home. I didn't buy any DVDs this time and it'll probably be a while before I go to Walmart again due to the financially crippling situation I'm in right now from owing my dentist for an hour and half's work with several more to come. Yes, you can see from my diet of sweeties how that all came about. Have you been to Walmart lately? Have you bought anything good or any of the Multi-Features? Let me know in the comments below.